John Williams is owner of TerraZoom, a Colorado-based web development shop specializing in web mapping and online image zooms. He also writes the award-winning blog, StarryCritters, an interactive site devoted to looking at images from NASA's Great Observatories and other sources in a different way. A long-time science writer and space enthusiast, he created award-winning Hubble Star Cards. Use coupon code UNIVERSE to Hold the Universe in your hands. Follow John on Twitter @terrazoom. Here’s our brand new infographic for this week’s best space images. Feel free to share and re-post! Far away, deep in the dark, near the edge of interstellar space, Voyager 1 and 2 are hurtling near the tenuous edge of the magnetic bubble surrounding the Sun known as the heliosphere and NASA wants you to ride along. The Voyager website sports a new feature showing cosmic ray data. NASA’s Eyes on the Solar System, a popular Web-based interactive tool, contains a new Voyager module, that not only lets you ride along for the Voyagers’ journeys but also shows important scientific data flowing from the spacecraft. As Voyager 1 explores the outer limits of the heliosphere, where the breath from our Sun is just a whisper, scientists are looking for three key signs that the spacecraft has left our solar system and entered interstellar space, or the space between stars. Voyager 1 began heading for the outer Solar System after zipping through the Saturn system in 1980. The new module contains three gauges, updated every six hours from real data from Voyager 1 and 2, that indicate the level of fast-moving particles, slower-moving particles and the direction of the magnetic field. Fast-moving charged particles, mainly protons, come from distant stars and originate from outside the heliosphere. 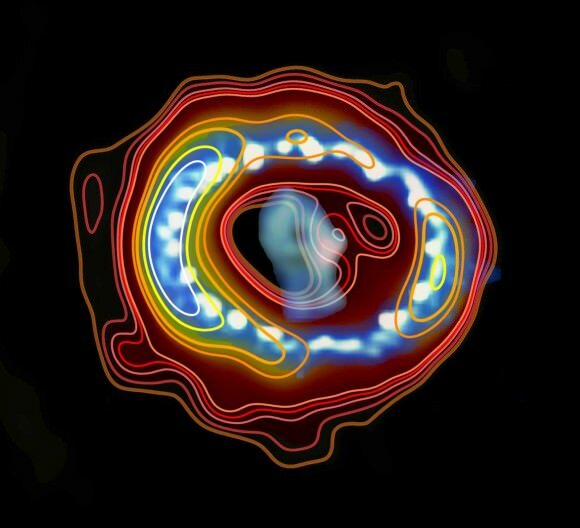 Slower-moving particles, also mainly protons, come from within the heliosphere. Scientists are looking for the levels of outside particles to jump dramatically while inside particles dip. If these levels hold steady, it means the Voyager spacecraft no longer feel the wind from our Sun and the gulf between stars awaits. Over the past couple of years, data from Voyager 1, the most distant man-made object, show a steady increase of high-powered cosmic radiation indicating the edge is near, scientists say. Voyager 1 appears to have reached the last region before interstellar space. Scientists dubbed the region the “magnetic highway.” Particles from outside are streaming in while particles from inside are streaming out. Voyager 2’s instruments detect slight drops in inside particles but scientists don’t think the probe has entered the area yet. Scientists also expect a change in the direction of the magnetic field. While particle data is updated every six hours, analyses of the magnetic field data usually takes a few months to prepare. A snapshot riding along with Voyager 1’s looking back at the Sun and inner solar system. The positions of Voyager 2 and Pioneers 10 and 11 show within the viewport as well. Although launched first, Voyager 2 lags behind its twin Voyager 1 by more than 20 times the distance between the Earth and the Sun. Voyager 2 blasted off August 20, 1977 aboard a Titan-Centaur rocket from Cape Canaveral, Florida. The nuclear-powered craft visited Jupiter and Saturn with an additional mission, called the Grand Tour, to study Uranus and Neptune. Voyager 1 launched two weeks later on September 5, 1977. With a faster flight path, Voyager 1 arrived at Jupiter four months before its sister craft. Voyager 1 went on to study Saturn before using the ringed planet’s gravity field to slingshot it up and out of the plane of the solar system toward the constellation Ophiuchus, the Serpent Bearer. NASA’s Eyes on the Solar System allows viewers to hitch a ride with any of NASA’s spacecraft as they explore the solar system. Time can be slowed for a near approach of a moon or asteroid or sped up to coast between the planets. Watch close at just the right moment and you can witness one of the spacecrafts roll maneuvers. All spacecraft movements are based on actual spacecraft navigation data. Check out the Voyager module here, and check out the rest of the the Solar System here at Eyes on the Solar System. This Week’s Best Space Photos – April 26, 2013. Ancient iron-loving bacteria may have scooped up evidence of a nearby supernova explosion 2.2 million years ago, leaving an extraterrestrial iron signature in the fossil record, according to German researchers presenting their findings at a recent meeting of the American Physical Society. In 2004, German scientists reported finding an isotope of iron in a core sample from the Pacific Ocean that does not form on Earth. The scientists calculated the decay rate of the radioactive isotope iron-60 and determined that the source was from a nearby supernova about 2 million years ago. The blast, they say, was close enough to Earth to seriously damage the ozone layer and may have contributed to a marine extinction at the Pliocene-Pleistocene geologic boundary. Shawn Bishop, a physicist with the Technical University of Munich in Germany and the primary author of the recent study, wondered if traces of the supernova could be found in the fossil record as well. Some deep sea bacteria soak up iron creating tiny magnetic crystals. These 100-nanometer-wide crystals form long chains inside highly-specialized organelles called magnetosomes which help the bacteria orient themselves to Earth’s magnetic field. Using a core sample from the eastern equatorial Pacific Ocean, Bishop and his team sampled strata spaced about 100,000 years apart. By using a chemical treatment that extracts iron-60 while leaving other iron, the scientists then ran the sample through a mass spectrometer to determine whether iron-60 was present. And in the layers around 2.2 million years ago, tiny traces of iron-60 appeared. Although the scientists are not sure which star exploded to rain radioactive iron onto Earth, the scientists refer to a paper from 2002 that points to several supernovae generated in the Scorpius-Centaurus star association. The group of young stars, just 130 parsecs (about 424 light-years) from Earth, has produced 20 supernovae within the past 11 million years. Source: Nature.com and APS.org “Abstract X8.00002: Search for Supernova 60FE in the Earth’s Fossil Record”, Physical Review Letters, “Evidence for Nearby Supernova Explosions” and 60Fe Anomaly in a Deep-Sea Manganese Crust and Implications for a Nearby Supernova Source. The Week in Space Pictures was something new we launched last week and we’re trying to improve on it with this eye-catching info graphic. Let us know what you think! With its 180 degree views of Earth and space, the ISS’s cupola is the perfect place for photography. But Austrian researchers want to use the unique and panoramic platform to test the limits of “spooky action at distance” in hopes of creating a new quantum communications network. In a new study published April 9, 2012 in the New Journal of Physics, a group of Austrian researchers propose equipping the camera that is already aboard the ISS — the Nikon 400 mm NightPOD camera — with an optical receiver that would be key to performing the first-ever quantum optics experiment in space. The NightPOD camera faces the ground in the cupola and can track ground targets for up to 70 seconds allowing researchers to bounce a secret encryption key across longer distances than currently possible with optical fiber networks on Earth. “During a few months a year, the ISS passes five to six times in a row in the correct orientation for us to do our experiments. We envision setting up the experiment for a whole week and therefore having more than enough links to the ISS available,” said co-author of the study Professor Rupert Ursin from the Austrian Academy of Sciences. Albert Einstein first coined the phrase ‘spooky action at a distance’ during his philosophical battles with Neils Bohr in the 1930s to explain his frustration with the inadequacies of the new theory called quantum mechanics. Quantum mechanics explains actions on the tiniest scales in the domain of atoms and elemental particles. While classical physics explains motion, matter and energy on the level that we can see, 19th century scientists observed phenomena in both the macro and micro world that could not easily explained using classical physics. In particular, Einstein was dissatisfied with the idea of entanglement. Entanglement occurs when two particles are so deeply connected that they share the same existence; meaning that they share the same mathematical relationships of position, spin, momentum and polarization. This could happen when two particles are created at the same point and instant in spacetime. Over time, as the two particles become widely separated in space, even by light-years, quantum mechanics suggests that a measurement of one would immediately impact the other. Einstein was quick to point out that this violated the universal speed limit set out by special relativity. It was this paradox Einstein referred to as spooky action. CERN physicist John Bell partially resolved this mystery in 1964 by coming up with the idea of non-local phenomena. While entanglement allows one particle to be instantaneously influenced by its exact counterpart, the flow of classical information does not travel faster than light. The orbital pass of the ISS over an optical ground station could be used for quantum communication from inside the Cupola Module, as long as the OGS is not more than 36° off the NADIR direction. Credit: T Scheidl, E Wille and R Ursin. The ISS experiment proposes using a “Bell experiment” to test the theoretical contradiction between predictions in quantum and classical physics. For the Bell experiment, a pair of entangled photons would be generated on the ground; one would be sent from the ground station to the modified camera aboard the ISS, while the other would be measured locally on the ground for later comparison. So far, researchers sent a secret key to receivers just a few hundred kilometers apart. The researchers point out that making the minor alteration to a camera already aboard the ISS will save time and money needed to build a series of satellites to test researchers’ ideas. Today, we see an unobstructed view of the cosmos in all directions. But, a time existed near the Big Bang when the space between galaxies was an opaque fog where nothing could be seen. And according to two University of Michigan researchers, rare Green Pea galaxies, discovered in 2007, could offer clues into a pivotal step, called reionization, in the Universe’s evolution when space became transparent. Reionization occurred just a few million years after the Big Bang. During this time, the first stars were beginning to blaze forth and galaxies. Astronomers believe these massive stars blasted the early universe with high-energy ultraviolet light. The UV light interacted with the neutral hydrogen gas it met, scraping off electrons and leaving behind a plasma of negatively charged electrons and positively charged hydrogen ions. “We think this is what happened but when we looked at galaxies nearby, the high-energy radiation doesn’t appear to make it out. There’s been a push to find some galaxies that show signs of radiation escaping,” Anne Jaskot, a doctoral student in astronomy, says in a press release. In findings released in the current edition of the Astrophysical Journal, Jaskot and Sally Oey, an associate professor of astronomy, the astronomers focused on six of the most intensely star-forming Green Pea galaxies between one billion and five billion light-years from Earth. The galaxies are compact and closely resemble early galaxies. The objects are thought to be a type of Luminous Blue Compact Galaxy, a type of starburst galaxy where stars are forming at prodigious rates. They were discovered in 2007 by volunteers with the citizen science project Galaxy Zoo. Named “peas” because of their fuzzy green appearance, the galaxies are very small. Scientists estimate that they are no larger than about 16,000 light-years across making them about the size of the Large Magellanic Cloud, a irregular galaxy near our Milky Way Galaxy. Using data from the Sloan Digital Sky Survey, Jaskot and Oey studied the emission lines from the galaxies to determine how much light was absorbed. Emission lines tell astronomers not only what elements are present in the stars but also much about the intervening space. By studying this interaction, the researchers determined that the galaxies produced more radiation than observed, meaning some must have escaped. So much space awesomeness this week. Satellites collect more than just pretty pictures. NASA’s Earth Observatory website released this temperature anomaly map above, based on data from the Moderate Resolution Imaging Spectroradiometer (MODIS) on NASA’s Aqua satellite, shows how this affected temperatures in the Northern Hemisphere. Credit and copyright: Göran Strand. Our viewers have been sending in gorgeous pictures of Comet PANSTARRS paired with the Andromeda Galaxy, or M31. Göran Strand shared this view taken from Sweden on April 4, 2013 on Universe Today’s Flickr photo stream. Credit: NASA/Johns Hopkins University Applied Physics Laboratory/Southwest Research Institute. With more than 400 active volcanoes, Io is the most volcanically active world in the Solar System. However, according to a new study released this week, the locations of Io’s volcanoes don’t quite line up where scientists think they should be. This five-frame sequence of images from NASA’s New Horizons mission captures the giant plume from Io’s Tvashtar volcano in March, 2007. These three frames from NASA’s Hubble Space Telescope show the supernova dubbed SN UDS10Wil, or SN Wilson, the most distant Type Ia supernova ever detected. The leftmost frame in this image shows just the supernova’s host galaxy, before the violent explosion. The middle frame shows the galaxy after the supernova had gone off, and the third frame indicates the brightness of the supernova alone. This sequence of seven images from the High Resolution Imaging Science Experiment (HiRISE) camera on NASA’s Mars Reconnaissance Orbiter shows wind-caused changes in the parachute of NASA’s Mars Science Laboratory spacecraft as the chute lay on the Martian ground during months after its use in safe landing of the Curiosity rover. The combined light of NASA’s Great Observatories creates amazingly beautiful images. A part of the Small Magellanic Cloud galaxy is dazzling in this new view from NASA’s Great Observatories. The Small Magellanic Cloud, or SMC, is a small galaxy about 200,000 light-years way that orbits our own Milky Way spiral galaxy. Credit and copyright: Paul Andrew. Sheets of luminous plasma arc into space in this image of a large prominence from the Sun, taken on April 1, 2013. Using the Australia Telescope Compact Array radio telescope in New South Wales, Australia, Supernova 1987A has been now observed in unprecedented detail and created this overlay of radio emission (contours) and a Hubble space telescope image of Supernova 1987A. Prometheus keeps lonely watch over Saturn’s F-ring in this image from NASA’s Cassini mission. This view looks toward the unilluminated side of the rings from about 52 degrees below the ringplane. The image was taken in visible light with the Cassini spacecraft narrow-angle camera on Jan. 15, 2013.